Mike Nesbitt said that when ranking candidates in preference, using the election’s single transferable vote system, he would select the SDLP after supporting the UUP’s own candidates on the ballot paper. However, he did not say he would advise other UUP supporters to adopt the same approach. The UUP and SDLP have argued they could form an alternative partnership government at Stormont to take the place of the long-standing DUP-Sinn Fein-led coalition. Named UUP leader in 2012, Mr Nesbitt is a former TV anchor man who has struggled to inject life into a party long marginalised by the more populist and hardline unionism of the DUP. If borne out on ballot papers, Nesbitt’s move could break new ground in the traditional ‘sectarian headcount’ that normally passes for electoral politics in the Six Counties. But his remarks drew strong criticism from within his own party, as well as from his unionist rivals. Rosemary Barton of the UUP in Fermanagh South Tyrone did the same, as did Harold McKee in South Down. UUP councillor Carol Black went so far as to resign, complaining that the “whole ethos of the party has been destroyed”. In Upper Bann, UUP candidate Doug Beattie said that he wouldn’t be recommending that the party’s supporters gave their third preference to the SDLP’s Dolores Kelly, but adopted a more tactical approach. “I guess all areas are different. In some, a vote for the SDLP will take a seat off Sinn Fein. Strategic thinking needed,” he said. Nesbitt stressed that his stance was personal, not prescriptive. “What I am trying to achieve is a stretch for some people; it’s not going to be easy, and if it was we would have done it by now,” he said. He declared that the “status of Northern Ireland was under zero threat” and the constitutional issue was not relevant to the election campaign. “I wanted to send out a signal that it does not have to be the same old, same old everywhere,” he said. 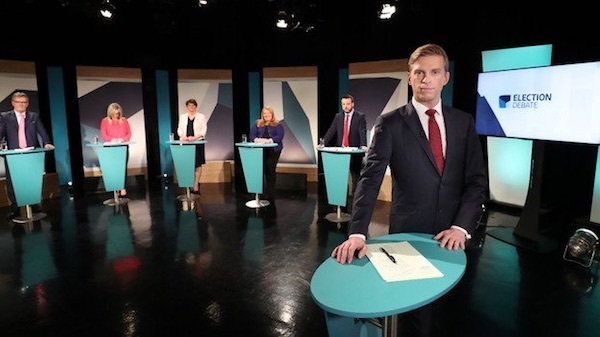 Meanwhile, a televised debate among the five main party leaders on Thursday night gave a mixed response to the development. Naomi Long of the Alliance Party compared her Ulster Unionist counterpart to a bed-hopping political “Lothario” for his efforts to form various pre-election pacts in recent years. Ms Long, who like the SDLP and the UUP is chasing the centre vote, gave only faint praise Mr Nesbitt’s call for cross-community votes. DUP leader Arlene Foster warned that Mr Nesbitt’s willingness to transfer votes across the divide was “very, very dangerous” and could weaken unionism and lead to a vote on a united Ireland. Sinn Fein’s Michelle O’Neill chose to put the focus of her comments entirely on the DUP, its leader Arlene Foster and the corruption scandal over the scheme known as the Renewable Heat Initiative (RHI). She accused Arlene Foster’s party of showing “arrogance and contempt” for the Six County institutions. “Sinn Fein didn’t seek this election but it is needed because of DUP arrogance, contempt and serious allegations of corruption surrounding their RHI scandal,” she said. In response, Ms Foster raised eyebrows when she warned voter over the “radical republican agenda” of Sinn Fein, a party she repeatedly referred to as “Gerry Adams’ Sinn Fein”. She claimed that the RHI issue was the “excuse but not the reason” that Sinn Fein used to trigger the election. “It is all about Gerry Adams’s republican agenda because he did not get his way,” she said.